Unfold five feet of creepy-crawliness—and explore twelve of the world’s most impressive arthropods. They can live anywhere on earth. There are more than a million different species. And while they may have no backbone, their hard outsides give them plenty of staying power! Here are a dozen favorites: the European praying mantis, the Asian giant hornet, the Arizona bark scorpion, the stag beetle, the Mexican red-kneed tarantula, the army ant, the American cockroach, the atlas moth, the anopheles mosquito, the North American millipede, the giant weta, and the pill woodlouse. Crawling with bold, colorful illustrations and fun facts, this cleverly designed, accordion-style guide will hold bug enthusiasts in its thrall. This pop-up reference book all about insects would be great for the insect fan in your life. 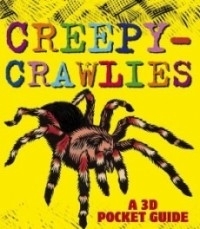 I'm not so big on creepy-crawlies, so the illustrations gave me the willies. I guess that proves how accurate the drawings are! The layout of this 3D pocket guide is great for small hands. Each page has a large image of the insect in question with a brief set of facts. There are also definitions of important terms. The illustrations are quite lifelike, and there is a "harmful" symbol beside the insects that may be harmful to humans. The illustrations of the insects aren't to scale, so it was difficult to determine just how large or small the insects would be in real life. Most of them are pretty accurate, but others are impossible to tell unless you've seen one in person. But this is a pocket guide, so drawing the insects to scale is much harder in such a small, handheld format. Perfect little book for children who can't get enough info about insects to suit them.